The Marine Park consist of three bays, Las Barracas, Cabo Pulmo and Los Frailes. Most of our diving is done in Cabo Pulmo due to the unique concentration of coral reefs. 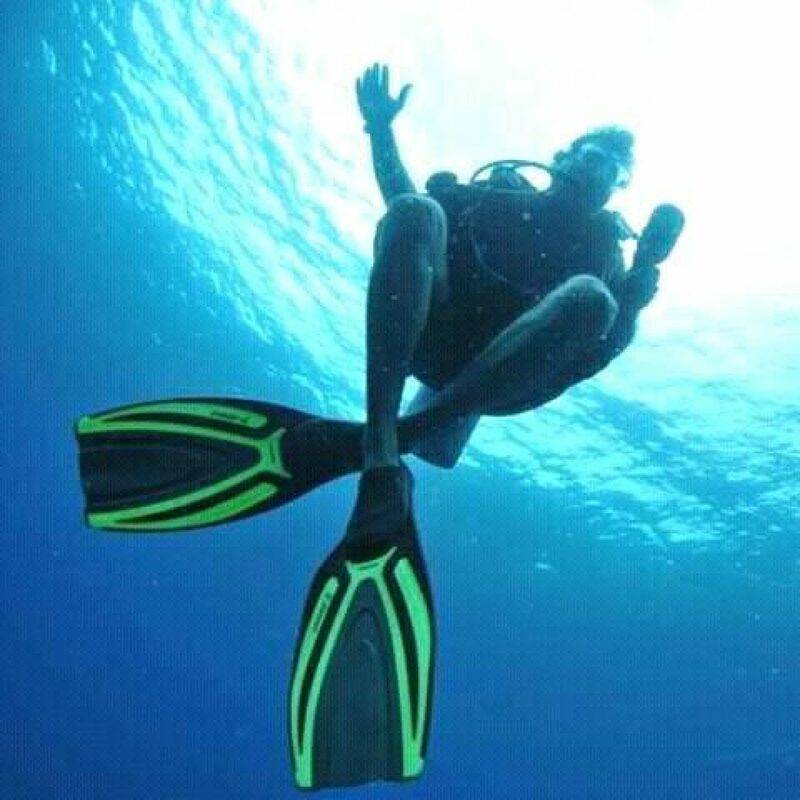 El Parque Nacional de Cabo Pulmo , consiste en 3 bahias que son Las Barracas , Cabo Pulmo , Los Frailes , pero los sitios mas predominantes para buceo se encuentarn en la Bahia de Cabo Pulmo por la mas concentracion de arrecifes coralinos. El Bajo: This reef is truly special and so close to the edge of the submarine canyon. It’s about 500 yards long and 30 yards wide and up to 50 feet deep. It runs south to north with sand on both sides. In the winter months a lot of sting rays come to reproduce in the sand. We also have a large community of garden eels that live here year round. The reef has 7 kinds of corals, hard and soft, as well as the largest concentration of fish, both resident and migratory. Este arrecife es muy especial por la posicion donde encuentra , muy cerca de la orilla del cayon , es aproximadamente medio kilometro de largo y 20 metros de ancho , correo de sur a norte con arena a los dos lados , ofrece las 7 variedades de corales , cardumnes de peces arrecifales y meros , durante el invierno llegan muchas mantarayas , existe una comunidad enorme de anguilas de jardin , asi como peces migratorios. I have seen green turtles, leather backs and the carey. May and June is the best time to see the biggest fish in the ocean, the phenominal whale shark. Since it is so close to the canyon I have seen oar fish and whales and dolphins. Ever since becoming a Marine Park the fish population has increased. Even sharks come close to the coral reefs especially near the Cantil (The Ledges). This Reef is the largest reef in Cabo Pulmo. It starts near the beach and it goes two miles out to sea, it is about 40 yards wide and shaped like fingers. Crowned predominantly by hard coral in Cabo Pulmo (The Elegant Coral) as well as other species of hard and soft coral, just like rolling hills in the country side, the elegant coral heads fuse together, then at the edge of the reef it lots of caves and ledges for the dog snapper to hide in as well as all kinds of invertebrates. Over the last two years I have noticed an increase in the shark population such as the hammerhead, white tip reef shark and migratory ones like the manta ray, and amber jacks. The deepest spot is 50 feet and from the top to the reef its about 25 feet. Great site for all levels of SCUBA divers as well as good snorkeling. He visto muchas tortugas entre ellas como es la carey , prieta , golfina, en Mayo y Junio es la migracion del majestuoso ” Tiburon Ballena ” , y como esta cerca del cayon he visto especies como el Pez Remo , Ballenas , delfines. Desde que se decreto como Parque Nacional a aumentado la biomasa de Peces increiblemente. Los Morros is a broken off reef almost right next to El Bajo It’s very attractive due to the large concentration of fish from its neighbor. its about 400 yds long and 50 feet deep sometimes when there is a very good current going I like to dive the two sites consecutively , they’re only about 20 yds apart. We also have a ship wreck El Vencedor on sandy bottom. Sunk in 1981, the story I heard from the locals is that it had hit a coral reef and and sank slowly. Now is a nice reef what once was a 100 foot wooden tuna boat. The locals got most of the hull and whatever they could salvage. Some people built their homes with it, anyway now it’s a great home for all kinds of marine life such as the giant “jew fish” as well as the large community of eels, puffers, garden eels, snappers, and every fall you’ll see the “caballito” (baited fish) that comes to reproduce here; its like fish soup !!! Great for all levels of divers!! For those divers that like the deep sea we have a dive site called the Profundo. It’s the deepest reef in this area, about 1000 yds long and 30 yds wide and 100 feet deep. There is very little coral, but it is host to a lot of the big fish like dog snapper, big groupers, and it’s the home for the “Tiburon Gata” (Nurse Shark).Only for the experienced divers. This dive site is one of the most fun ones and interesting due to the amount of sea fans, all kinds of fish and life you can find on them, also the boulder formations are great places for eels, pargos, octopus and the rare stone scorpion fish, depending on the season but there are times when the Big Eye Jacks come and hang here for a while; it’s like a fish parade. Depth 60 feet, good for all levels great photo ops! This place is the only one in the entire Park with huge rocks and caves and crevices, inside the rocks there are the most beautiful cup coral around.Also it is host to many different species of fish including the “frog fish”.Occasionionally I have seen the the Jew Fish. It weights about 800 pounds and he/she likes to hang around the inside of caves, the place is like a fish tank and on the sand you can see the garden eels like no other place in the Baja. It’s fun to watch these beautiful mammals play. Spring being mating season is when they’re the most active. At times you’ll encounter young pups that love to play with you although the mothers sometimes don’t like it, the fathers don’t to seem to care about it, I have been playing with them on occasion, they like to take your snorkel and play with them like a stick. They’re also all kinds of angelfish and other tropical fish around and if you are lucky, you may see the pilot whales and the sailfish. Come on down and get wet! Water temperature in the 80’s and visivility up to 100 feet. Its the migratory time of the year for species such as : Whale Shark, Pacific Giant Manta Ray, all kinds of mammals, and pelagic fish such as wahoo, sail fish. Water temperature in the 70’s and visivility under 100 feet due to the northeast winds but marine life nevertheless amazing, migration of species such as: Humpback whales, orcas, blue whales,grey whales, sperm whales, small mantas by the hundreds and pelagic fish such as yellow fin tuna and groupers. Water temperature in the mid 60’s and visivility around 40 feet or as low as 15 feet due to the large concentretion of plankton, but the marine life is amazing with eagle rays, eels, octopus etc.. everybody comes to reproduce so you can find all the species from the sea of Cortes including the Whale Shark again. Water temperature in the mid 80’s and visivility is 100 feet+, although you never know it can change as low as 5 feet depending on hurricanes this time of the year but its the most comfortable and fun for diving great for photography of species such as the Jew fish and huge school of pelagic fish, eel mating time of the year.